The LUXDrive offering extends beyond low voltage drivers and light engines to include Light Modules. 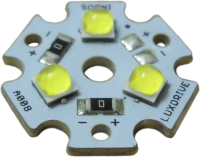 In some applications, an on-board driver is not required and for those instances, LEDdynamics offers an array of Light Modules in varying shapes, sizes and LED count. Utilizing the latest LEDs from industry leading suppliers, LEDdynamics offers standard light modules that will meet the needs of most any project. When requirements exceed the capabilities of our standard offering, LEDdynamics can develop a custom light module to meet your exact needs. As always, whether it be standard or custom, LEDdynamics will strive to deliver a solution that meets and exceeds your expectations.